Burberry Body Rose Gold is designed for a carefree and stylish girl. Burberry Body Rose Gold 85ml. 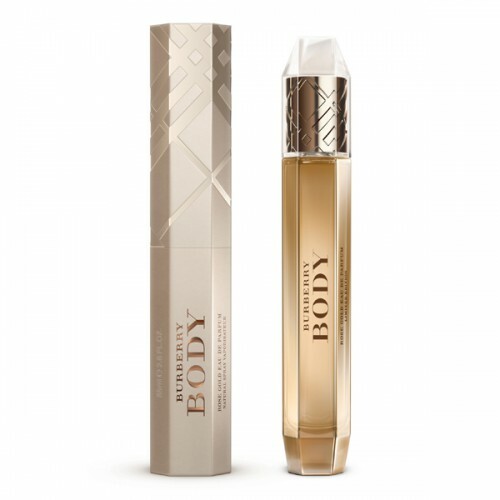 Eau De Parfum - This women's eau de parfum released in a limited edition bottle in 2012, as a gift for an anniversary for all fans of Burberry Body exquisite flavor. It is designed for strong, stylish, self-confident women, who are accustomed to always achieve their goals. Body Rose Gold - an exquisite decoration for a true lady. Perfume bouquet of rich and powerful musky-woody fragrance stunningly charismatic and strong, but at the same time, royally pacified. The fragrance captivates, excites, and this is not surprising. After all, the charm of sweet fruit and tartness wood quivering successfully intertwined with floral accents. Thus was born the elegant sensuality and passion Body Rose Gold, a worthy decorate the beauties surrounding their charm and splendor. Spirits carry the exclusivity and originality of rose gold - bright and attractive. Each note - this is a stunning embodiment of grace, trepidation, tenderness, charm. Precious energy charm and unique charm poetic, passionate, seductive and elegant. Date of release : 2012 Country manufacturer : France Gender : Female Classification of flavor : floral, woody-musky Starting note : Absinthe, peach and white freesia note " heart ": rose, iris and sandalwood final note : wood, amber, musk and vanilla. Spirits are family floral woody musk-flowers, they mark the first anniversary of the birth of the series debut fragrance - Body. The smell surrounds their jubilant owners aura of tenderness and romanticism. Heroines Rose Gold (Pink Gold), elegant and sensual, elegant and passionate, poetic and feminine. Bouquet is located in a stylish classical bottle polished rose gold, emphasize the elegance of the precious contents.